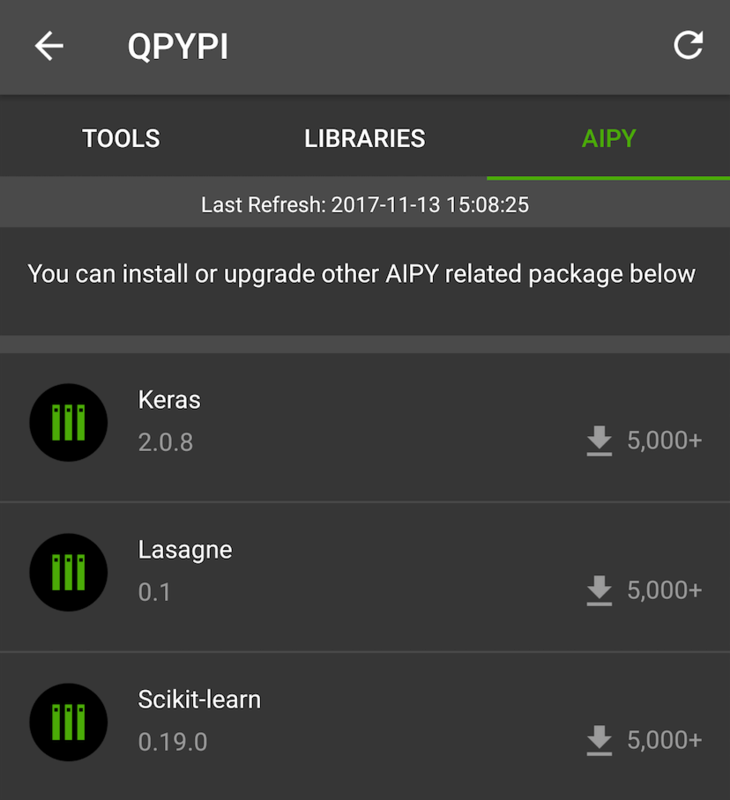 AIPY is a high-level AI learning app, based on related libraries like Numpy, Scipy, theano, keras, etc.... It was developed with a focus on helping you learn and practise AI related programming well and fast. Now, AIPY is released as a QPython plugin, aftering being installed, you could see the AIPY category in QPYPI, where you could find Numpy, Scipy, Pandas, Matplotlib, Scikit-learn, Theano, Lasange, Keras. By installing these libraries, you could start mathematics, scientific, data analytics, deeplearning etc. with QPython. You should install AIPY application first, then please make sure you have the QPython(version >=2.0.7) installed. If you have complete the previous step, then you could launch QPython and enter the QPYPI, you will see the AIPY category, from where you could install the related libraries. They are numpy, scipy, pandas, matplotlib, scikit-learn, theano, Lasagne, keras etc. It runs on top of theano in QPython now, we will try to add tensorflow and other deeplearning frmaework in the future. Lasagne is a lightweight library to build and train neural networks in Theano. Theano is a Python library that allows you to define, optimize, and evaluate mathematical expressions involving multi-dimensional arrays efficiently. Besides these high-level AI related libraries, QPython supports the following libraries also. In QPython you could use the webagg as backends with tornado, please install tornado from QPYPI and make sure your script contains the below declarations. Scikit-learn is a Machine Learning framework in Python. It’s AIPY’s first release, we will keep developing, and bring more amazing features. Please give us any feedback to support@qpython.org. Built with Sphinx using a theme provid by QPython. Copyight 2017, QPython.